There really is nothing better than going to see a band perform live. The experience is something that just can’t be replicated, although bands continue to try. The Birthday Massacre released their live CD/DVD “Show and Tell” this year, to bring the live show into your home. While the experience of watching a live recording of a band’s performance in your living room, is never the same as actually going to the show, being amongst all the fans and feeling the vibe and excitement of seeing the band play right infront of you; live DVD’s are good for those who for some reason or another have been unable to attend a live performance. 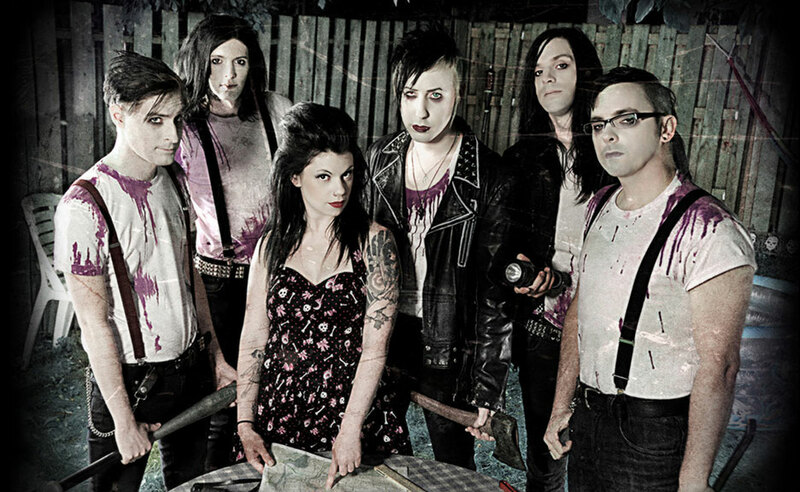 The Birthday Massacre are a band that are very much a visual experience as well as an auditory one. After seeing them perform live, fans have a whole new appreciation and love for their music. Unfortunately, there are fans who have not had the opportunity to go to a Birthday Massacre concert. This is where the DVD comes into play. While it does not provide a 100% representation of the live experience as a whole, it does allow fans to see and hear the band live. One of the great benefits of having a live DVD of The Birthday Massacre, is the ability to see the band clearly on stage. This is an advantage even to those fans who have been to one of their concerts. The camera is not focused on just one member of the band, but alternates between all members, so that the viewer is able to see how the band as a whole looks on stage. This new perspective is often more desirable than having a head in your line of view, or standing in a position that only allows the side of the stage to be in clear view. Although many would argue that is all part of the live experience, at least the DVD allows you to relive the show, but with clearer vision. When watching the “Show and Tell” DVD, there are plenty of shots of the audience, from the audience’s view and the crowd cheers are heard, to give the viewer that feeling of being there and being amongst the crowd. The fact that the quality of the sound is actually live quality and not tampered with to sound just like another studio recorded CD, makes it that little bit more real and lets the viewer hear how the band really is live. As The Birthday Massacre are a visual experience, this DVD allows fans to truly see that and gives depth to their music. Chibi’s cute gothic pixie persona, mixed with her eerie vocals and often “Living Dead Doll” look about her, makes listening to the songs more exciting and really gives life to them. Just listening to a live recording is not enough for The Birthday Massacre. You really need to see them on stage and be able to listen to their music, while seeing Chibi on stage in your mind’s eye, to really get the full Birthday Massacre experience. The show chosen for this live DVD was their show in Hamburg, Germany. The set list for this show was a great one to choose for the live recording, as it has all of The Birthday Massacre greats from their whole discography. For those who have never heard The Birthday Massacre, or weren’t sure where to start, “Show and Tell” is good because it highlights their strengths and shows a well rounded look at the bands work. A live DVD is always a bonus as whenever the desire to see The Birthday Massacre live arises, it’s a simple matter of putting the DVD in and pressing play. It also allows the band to take their live show to places they are otherwise unable to tour. While it does have it’s advantages it will never surpass the atmosphere of physically being in that crowd watching the band live. The DVD is never as exciting as the real live performance and can never provide the true experience. However, it does do enough to satisfy the urge to see them live and any fan of The Birthday Massacre would be amiss to not have this in their collection.